/How do Absolute Encoders work? 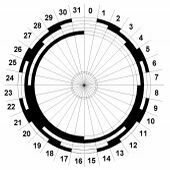 The principle of the incremental measuring system is the scanning of a line pattern on a glass or plastic disc (see Image 1). The states of the line pattern transparent or not transparent are converted into electronic pulses by an opto-electronic unit (e.g. transparent = 5V, not transparent = 0V). The analysis of the signals is performed in an evaluation unit by counting up or down with each pulse. The current count is stored in digital form and is instantly available for evaluation. Using this measuring system, every position of the measurement range/angle is identified by a definite code on a glass or plastic disc. This code is represented on the disc in the form of light and dark regions within different tracks. This combination relates to an absolute numerical value. Thus, the position value is always directly available, counters are not necessary. In addition it is not possible to get continuously invalid values caused by interferences or loss of the supply voltage. Movements which are done while the system is turned off are immediately measured after the system is powered up. The measuring system consists of a light source, a code disc pivoted in a precision ball bearing and an opto-electronic scanning device (see Image 3). A LED is used as a light source which shines through the code disc and onto the screen behind. The tracks on the code disk are evaluated by an opto-array behind the reticle. 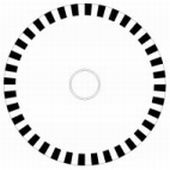 With every position another combination of slashes in the reticle is covered by the dark spots on the code disk and the light beam on the photo transistor is interrupted. That way the code on the disc is transformed into electronic signals. Fluctuations in the intensity of the light source are measured by an additional photo transistor and another electronic circuit compensates for these. After the electronic signals are amplified and converted they are then available for evaluation. Linear systems normally need more than one turn of a shaft. 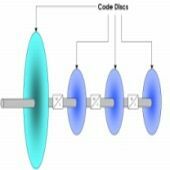 A single turn encoder is unsuitable for this type of application because of the additional requirement of the number of turns. The principle is relatively simple: Several single turn encoders are connected using a reduction gear (see image on left side). The first stage supplies the resolution per turn, the stages behind supply the number of turns. The gray code has to be converted into a binary code, because the single bits of the gray code don’t have a determined value. This is done by a code converter, that consists of a cascaded of XORs. Drivers that meet the RS 485 standard allow transmission rates up to 10 Mbps/s and line lengths up to 1200 m. This is entirely sufficient for most applications. The maximum transmission rate is dependant on the transmission length. After the last Low-to-High transition of a 26-clock sequence, a "L" signal appears on data output. The double (or multiple) successive position values are separated from another with this information. Fraba encoders are available with all common field bus. If more devices are necessary, it is possible to link more bus segments by using repeaters (signal amplifiers). At the end of each bus segment a termination resistor must be used. The number of slaves, which can be operated by a master, is dependent on the internal memory structure of the master. Up to 126 stations can be involved in the maximum configuration of a profibus system. The master is usually realized as a connecting module at the control system or as a pc interface card. Typical slave devices are sensors, actuators, transducers or display elements. Using a software configuration tool, a database is generated which contains the network structure with the necessary configuration and parameter data. The master accesses this database and transmits configuration data to the appropriate users when the profibus system is powered up. After this data is received and stored by the individual users, the system changes to ‘data exchange’ mode. Profibus operates according to the master slave principle with token passing. The master regulates the bus traffic. The request of input data and the writing of output data between the master & slaves are performed cyclically. If several masters exist, the access right is regulated by the exchange of a token. Conduit length independent on the number of participants, transmission rate,lengths of the input/output data. After the selection of the device class is performed, the appropriate parameters (e.g. resolution, direction of rotation, software limit switch, etc..) are saved in a database and transferred to the rotary encoder when starting the system. 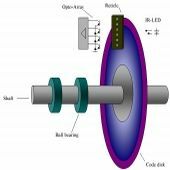 Data can be read from the rotary encoder (e.g. position value) or written to the encoder (e.g. preset value) using the input and output addresses determined in the configuration. The Baud rate is also determined in the configuration and is detected automatically by RABA rotary encoders. Further adjustments are not necessary with this system. CAN stands for Controller Area Network and was developed by the company Bosch for applications within the automobile area. In the meantime CAN has become increasingly used for industrial applications. CAN is a multi-masterable system, i.e. all users can access the bus at any time as long as it is free. * Polled mode: The position value is only given upon request. * Sync mode: After receiving a sync message by the host, the encoder answers with the current process value. If a node is not required to answer after each sync message, a parameter sync counter can be programmed to skip a certain number of sync messages before answering again. * Change of state mode: The position value is transferred when changing. CAN-ID Message Header Message Body 11 BIt 1 Byte 7 ByteThe DeviceNet protocol is based on the system of connections. In order to exchange information with a device, a connection must first be established. The CAN identifier is used for the characterisation of this connection. Additional parameters are also programmable such as direction of rotation, resolution and preset value. The adjustment of the node number and the Baud rate takes place in the connection cap using the turn switches. Easy programming and configuring is possible using the provided EDS file (electronics data sheet) with popular configuration tools. To connect single sensors and actuators in an economical way, a transmission technology adapted for various common operating conditions was developed.This is called INTERBUS loop. The INTERBUS loop connects terminals to a ring with a simple two-core unshielded cable. Using these two cores data information and voltage supply are delivered simultaneously. The data communication takes place in the form of load independent current signals. By this method the INTERBUS loop becomes so interference-proof that a shielded cable is not necessary.The coupling of the INTERBUS Loop to the INTERBUS remote bus is made by a special bus clamp. 63 INTERBUS loop participants can be connected per bus clamp. The successor of the INTERBUS loop, the INTERBUS loop 2 contains an integrated report and diagnostic manager and enables a larger distance between the users in the loop. The max. distance between the individual terminals is 20 m, the max. loop length 200 m.
This parameter is used to program the desired number of measuring units over the total measuring range. This value must not exceed the total physical resolution of the absolute rotary encoder. Revolutions < 4096 are programmable with a combination of the parameters ‘resolution/revolution’ and "total resolution".